There's A Little Pirate In All Of Us The title says it...there's a little pirate in all of us! 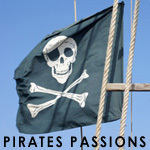 Sometimes we all need to take a step back and find that pirate in ourselves! I am proud to be a life-long pirate!